Awesome! I love the casual-ness of it, and the colors are so very fun and cheerful. Makes me smile! That is fun! Great colors and I like the bling dot on the i.
Hi Joan, I had no idea that you were still blogging. I have not received any of your update. 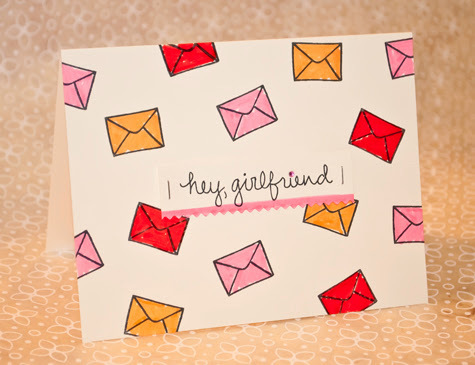 I love your Girlfriend card. What a wonderful way to let your girl friends no that they are being thought of. Have a wonderful weekend Joan. Well who knew you had another blog???? Not me until today! As a subscriber to your previous blog I'm a bit miffed that I had to find out by chance and have missed all the months I see in your blog archive list! Hope I can find time to look through your archive sometime. Glad to see that you are still stamping and making cards.